I was looking through old blog posts and realized that I had yet to write a post on favourite family hikes near Golden even though it’s one of our main ‘go to’ family activities – especially during the in-between seasons. So here it is, a post on some favourite ‘family-friendly’ hiking options. I’ve picked three hikes -- all close by and all relatively short (so they work well for younger kids and won’t threaten to take up the whole day). These hikes are also all quite manageable in terms of terrain and elevation gain, easy to access, and also start at lower elevations -- so you can hike them well into the fall without having to worry about snow. This is a classic family hike and definite favourite for kids. It’s hardly got any elevation change, and there’s a gorgeous waterfall at the end. 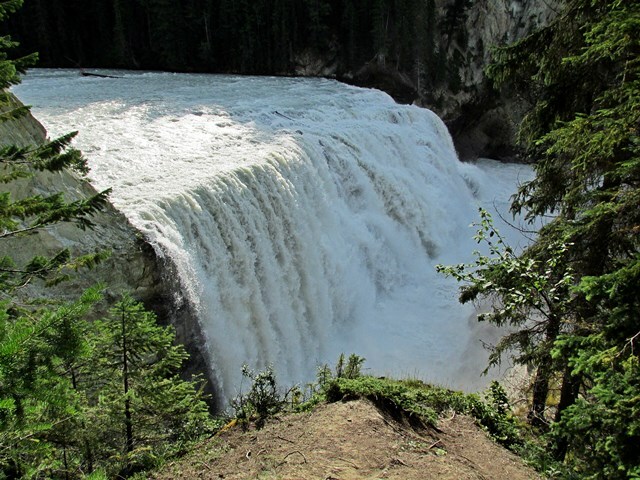 Wapta Falls is not known for its height but rather for its strength and breadth. It encompasses the whole width of the Kicking Horse River and is actually the largest waterfall in Yoho Park if you measure by volume of water. And the fun part for kids and families is you can play around in the spray and splash in the water at the bottom of the falls. Yes, it’s be a bit cold this time of year, but definitely still a thrill to be able to get so close to the base of a waterfall that you get soaked with its spray. As for timing, I would recommend giving yourself a couple of hours. It’s 4.8 kilometers round trip from the trailhead to the bottom of the falls. If you are heading out later in the fall or winter (yes, you can visit the falls all year round), there may be a gate up at the entrance, meaning you have to park there and walk in. This will add another 1.8 kilometers onto your hike each way. To get to the trailhead, head East from Golden on Highway 1 for about 30km until to see the Wapta Falls sign. The entrance is on your right. This is another great choice for kids and families because it comes with the bonus of getting to see hoodoos, which are pretty neat-looking, especially when you view them from the top. This hike’s similar to Wapta distance-wise – it’s just over 5 km round trip – but it’s got more elevation gain, about 340 meters, just so you know. The Yoho Park website calls it a ‘steep, dry, exposed trail,’ which to me doesn’t make it sound that nice. Quite to the contrary, it’s actually a beautiful hike with lots of variety and gorgeous views. Also, most of the trail is quite moderate and gentle, with a couple steep sections which is where you get most of your gain. The turnoff for this hike is pretty much a stone’s throw from the Wapta Falls turn off, just a bit further down the highway (continue heading East). For some reason, the sign on the highway shows the symbol for the Hoodoo Creek campsite but doesn’t show that little hiking stick person. Don’t worry, you’re still in the right place. Once there, take the gravel road through the Hoodoo Creek campground, then follow the sign which guides you left and over the creek (there is a little wooden beam bridge to get you across). From there you are off and on your way. 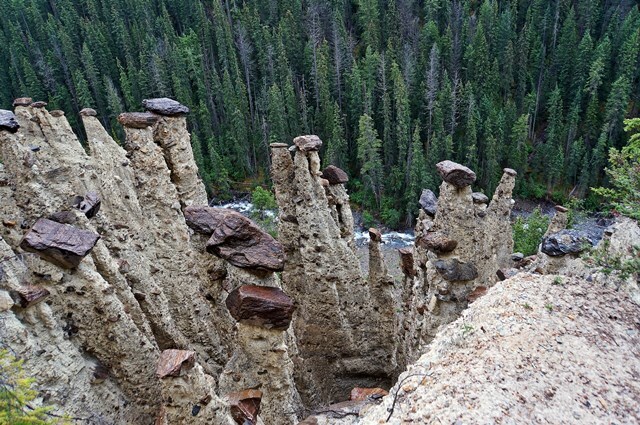 I recommend taking the upper viewpoint option – I love that view looking down at the hoodoos. This is one of our favourite ‘in and around town’ family hikes (when we don’t want to be out more than an hour or two and want to stay really to town. (Other great choices are Canyon Creek and Cedar Lakes I don’t know if this is actually the right name for his hike but it’s descriptive enough anyway that it tells you where you need to start – at the Cedar House Chalets and Restaurants. There’s a pull out on the road just outside the Cedar House entrance where you can park – you don’t want to drive into the Cedar House property and take up their parking. Walk the gravel road along the Cedar House property, which will take you by their different chalets (which by the way are gorgeous – if you haven’t stayed there before, seeing the property will surely make you want to!). The trailhead is on your right and clearly marked. We like the route that goes left at the ‘rockabout loop vs waterfall’ sign, which takes you down across Stacey Creek and back up to a nice wide trail that eventually connects into the Mountain Shadows biking trails. From there, we like the ‘trial and error’ loop because it includes a nice lookout stop along the way, where you get great views of the Columbia Wetlands, as well as good views of the ski hill and neighbouring mountains. And for more hiking ideas, check out Tourism Golden’s hiking map and the Golden Hikes website, where you can browse trails by difficulty as well as by area. 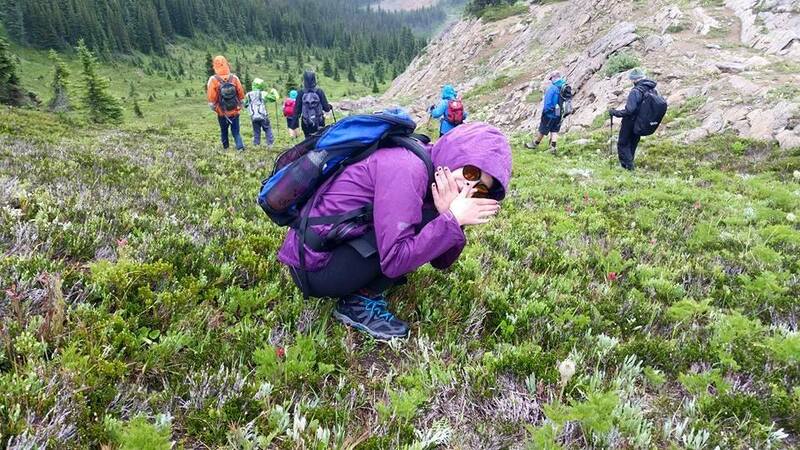 And of course, there’s the blog section on the Tourism Golden website, which has posts about other hikes people have done, including Gorman Lake, Howe’s Pass and more.